What can we learn from comets and asteroids, the universe's most misunderstood objects? According to Natalie Starkey, a space scientist who was a co-investigator for the European Space Agency's Rosetta Mission, quite a bit. In her new book, "Catching Stardust" (Bloomsbury Sigma, 2018), Starkey aims to reach everyone from scientists to science enthusiasts and explain what makes asteroids and comets so strange and remarkable and why it's so important to study them. Often confused for one another, comets and asteroids have been misunderstood for centuries. But comets aren't just dirty snowballs and, as Starkey explained in her book, we now know that asteroids can look just as much like comets as comets can look like asteroids. Read an excerpt from "Catching Stardust" here. 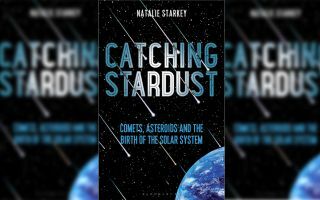 Natalie Starkey, a space scientist who worked on the Rosetta Mission, talks comets and asteroids in her new book Catching Stardust. Space.com: Do you often find that there is still confusion in distinguishing comets from asteroids? Natalie Starkey: Yes. I mean, that is one of the big things I wanted to get across in this book. [There was a] turning point with the Stardust Mission: [The solar system object it visited] was a comet, we knew it was a comet, it looked like a comet, it acted like one, it had a beautiful coma, or tail, out the back and everything. But actually, when they got the samples back, they found out that they looked a little bit like an asteroid — what we thought should be in an asteroid. It really turned around the thinking on the classical view of how these objects formed and where they formed. There'd always been inklings of it in the scientific literature, but we had no real proof [of] what was actually in these objects. We can still go with that classical view that comets are cold and they live in the far outer reaches of the solar system, and asteroids are kind of the hot, leftover objects from the planet- building phase. [However] there is a lot of overlap still. We have objects that sit right in the middle that are as much comet as they are asteroid. Space.com: Do you find that the idea of a "classical" comet or asteroid is still useful, since these lines are so often blurred? Starkey: Yeah, it's definitely still useful. The majority of objects in the asteroid belt, for example, are asteroidal: They look and behave like asteroids. But what we're finding is that there are some objects in there that don't behave or look as we expect them to. But it doesn't mean they're not an asteroid, it just means that asteroids are not mainly what we thought they were from the beginning of time. So, I think it's still useful to have the definitions. It's important to know if they've got a tail, if they've got ice, and if we therefore think they're an asteroid or a comet. It isn't that simple but we still need those definitions because, inherently, they are different objects and they did form in different locations in the solar system and probably at different times. An artist's rendering of the massive metal asteroid Psyche, which orbits the sun between Mars and Jupiter. Space.com: Early in the book, you mention that a comet impact on Earth could have sparked agriculture and human civilization — could you speak a bit more to that? Starkey: This was something I found a little bit after I read [proofread] the main draft. I came across this, and it was a really interesting idea — it's not proven, I have to add. It was a comet that had been observed … it was depicted in stone drawings in temples. They interpreted this to be something like a comet in the sky back in the times, and it looks like this comet collided with the Earth. And when we go back through the ice cores in Greenland, it actually shows that this event coincided with a sudden drop in global temperature. The idea really is that it kind of forced communities to come together because they needed to maintain crops and work out how they were going to feed themselves. The idea is that, if that hadn't happened, then the modern age of agriculture couldn't have started, because they needed that push, that sudden drop in temperature, which looks like it came from the comet impact. Space.com: Why is it so much better to sample from comets and asteroids directly than to study meteorites here on Earth? Starkey: There's quite a few reasons, and there's problems with both approaches. Ultimately, whenever you take a sample from something, you've got to maintain it in the exact form it was [in] on the body that you got it from. So, if a little piece of a comet or an asteroid is knocked off the body and it's sent to Earth … and lands as a meteorite, then it's going to have gone through the atmosphere, and it's going to have been heated up, and volatiles [molecules that can evaporate] will have been taken off it during this process. And so, when it lands on the surface, it isn't exactly like it was on the comet or asteroid. The other problem with meteorites is that they sit on the Earth for a while. Bugs have got into them, rain has gone on them, it's frozen. The next best step is to go into space and collect a sample from one of these objects and bring it back to Earth. Again, there's still problems because, if you think about it, we know that comets are cold and they're often quite icy, so if we collect a sample of a rock, you know, it's going to get heated up as it comes back — it's not going to stay in exactly the same conditions that it was on the comet. The other option is you can go into space and take a laboratory with you, which is what the Rosetta mission did. And just land on the side of that comet, not bring the sample home, but land on it and do the experiments on the comet that you were going to do at home. Again, there's always downsides to some things, and [for this approach] you can't get the same precision and accuracy on those measurements that you could if you brought the sample back to Earth. In terms of trying to measure these objects, it's tricky. There's never a perfect situation. NASA’s Stardust sample return capsule successfully landed at the U.S. Air Force Utah Test and Training Range at 2:10 a.m. Pacific time (3:10 a.m. Mountain time) on Jan. 15, 2006. The capsule contained cometary and interstellar samples gathered by the Stardust spacecraft. Space.com: What do you think was the most exciting takeaway or finding from the Stardust Mission? Starkey: The mission was relatively cheap; that was one of the great things about the Stardust Mission. It was cheap and it was quick. So, they went out, they collected samples, and they got back. And they were able to be analyzed really quickly. So, when they got back, for me, the most exciting finding was that there were these asteroid-like [hard, rocky] components within a comet. That really opened up our ideas about how these things formed. Suddenly we were, like, OK, we don't just have to limit ourselves, we don't just have to expect comets to be these very cold, outer solar system objects. Clearly, somehow, material from the inner solar system that formed where the planets formed has made its way to the comets or the comets maybe formed in a different location to what we thought. There's lots of possibilities, but that's what's so exciting. Space.com: It's pretty surreal that we were able to actually landon a comet in the Rosetta Mission. Do you think that one day this could be a routine practice? Starkey: Yeah, I think so. Rosetta was really groundbreaking. It was first approved in 1993. And then it launched in 2004, and then it took 10 years to get to the comet. I mean these are just incredibly long timescales. They had to kind of whittle down their process and be like, OK, we're just going to go to the comet, we'll take a laboratory there, and we'll land on it. I, having not been involved in the mission that long at that point, I didn't think it was going to work. But it did work. It did land, and it did do science on the comet, which is absolutely amazing. We have learned a lot from that mission. It's opened up a lot of new ideas for new missions. And when we look at mining, landing on objects is going to be quite important. I think in the next few decades, we're going to achieve a lot more on the surfaces of these objects. Space.com: Space Mining! Do you personally think that space mining will become as big of an industry as many are suggesting? Starkey: Yes, I do. I think it's going to be a really important thing in the next few decades because, first of all, it's really exciting that we can go to these objects and we can find materials on them that we need on Earth. Now, one of the problems with mining on Earth is that we often have to ruin some of our planet in order to get the materials we need. When we mine [rare elements on Earth], we have to exploit huge areas of the planet. And what you've got to think is that, OK, if we take one asteroid out of the equation of the trillions that are out there, we're not really going to notice it's gone — in fact, probably no one's going to notice it's gone. Space.com: And you've said that asteroid and comet mining could support future, off-Earth civilizations and missions as we venture farther into space. Starkey: Any one asteroid could be worth billions or trillions of U.S. dollars and so, although it might take a lot of money to get there and mine them, the return is potentially really, really enormous. So, it's really who's going to get there first. It's definitely not science fiction anymore. An artist's illustration of an asteroid headed for Earth. Space.com: Do you feel that we, right now, as a society, are prepared in case of an asteroid impact? Starkey: I would say no. I think most people are not really aware that we could get impacted by an asteroid or comet. But at the same time, the chances of us being impacted in the next 100 years is almost zero. We know that we're pretty safe for now. So, it's one of those problems which I tried to kind of get across in the book, that although we really don't need to worry about it for ourselves, we need to worry about it for our descendants, because almost certainly, they are going to be affected. Maybe not the next generation or even the one after that, but, you know, somewhere down the line, we're going to be affected by an impact from space. I think at this stage, at the moment, if we had a decade's notice that something was coming for the planet, we could potentially launch a mission in that time frame to do something about it. I think if we had less than a decade's notice, it seems at the moment that we don't have the technology in place to currently protect ourselves. Space.com: If you could have people who read this book take just one thing away from it, what would that be? Starkey: It's got to be that we need to explore the solar system more with spacecraft. I don't necessarily think we need humans to go out there at the moment, but that's my personal belief. At the moment, if we can make robotic instruments that can go out into space and explore…We can achieve so much. We've learnt so much about so the solar system just since the 1950s when we first started exploring it. And I think the only way for us to understand our planet and to understand the planets around us, how it formed, how humans got to Earth, or how organic material got to Earth, how we got our water, how everything formed, the only way to do that is to go out into space to explore these objects. We need to support space missions — of course I'm going to say that, because I'm a space scientist — but I really think it's important that we understand where we came from. This interview was edited for length. You can buy "Catching Stardust" at Amazon.com.